Going out and partying with friends, workmates, or even family members is a great way to relieve stress. When people go out to drink, there are some businesses like bars and pubs that see this as a great business opportunity. 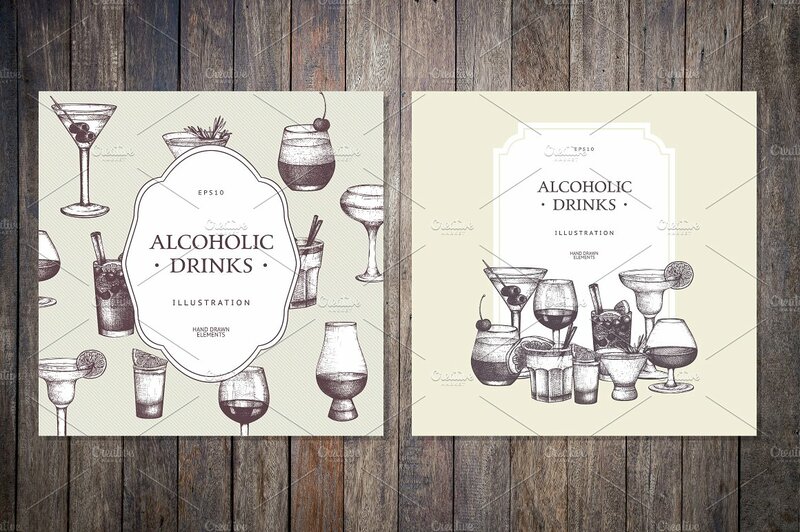 If you own a business that offers cocktails and other kinds of alcoholic drinks, always keep in mind that your customers directly look at the menu designs to identify whether your offering is interesting enough. To select the drink that they would like to order, people look not only at the price and description of cocktail options but also on how these options are presented using a cocktail menu design structure. Designing a cocktail menu will require you to consider a lot of things, especially when it comes to content and the final aesthetic that you will incorporate to the specified tool. 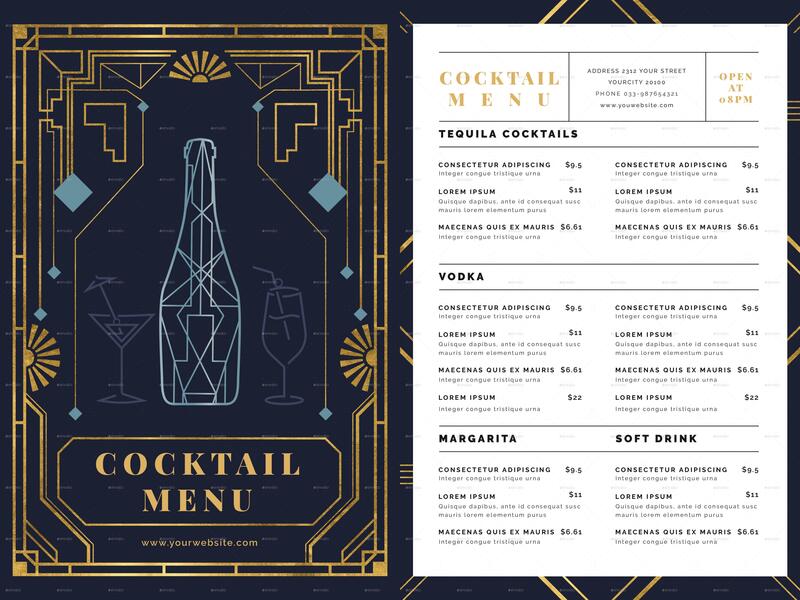 To help you have an easier, faster and efficient time when designing your business’ cocktail menu, we have curated a list of drink menu examples and designs that you may use as references. 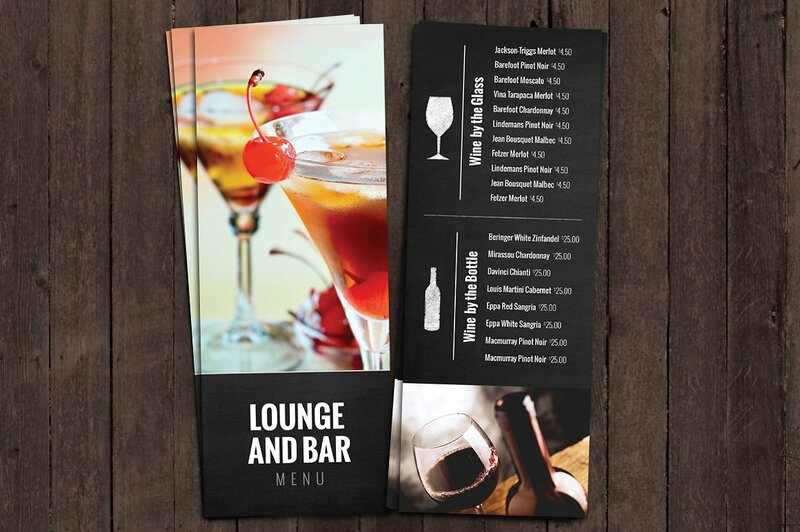 Just like when making a restaurant menu brochure design, you can also have different styles and techniques when putting together all these information. What is important is for you to ensure that they are presented in an organized and visually pleasing manner. Making a cocktail menu follows the same process that is applied when developing food menu examples. The only difference between the two kinds of menus is that the latter presents food options from appetizers to desserts while a cocktail menu is more focused on the drink selection of the business. 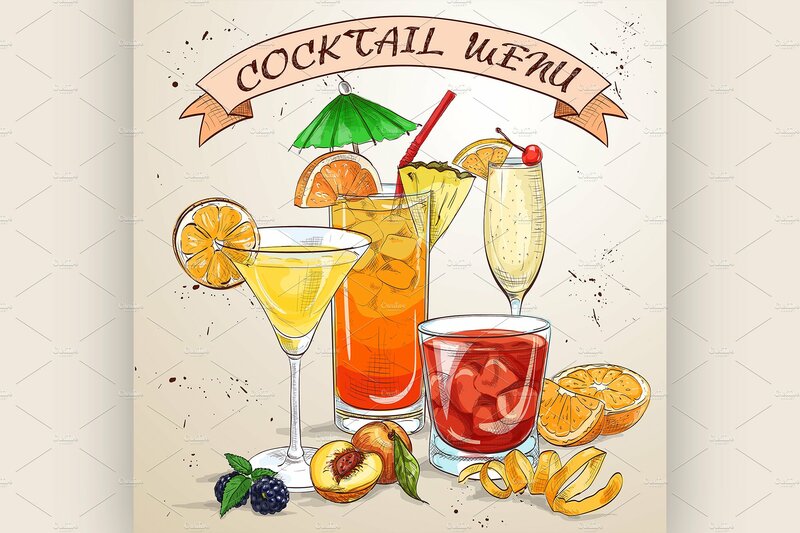 A complete cocktail menu can add up to the overall experience of your customers. If they are given a comprehensive menu, they will have an easier time to browse through the cocktail selection. This will also help them to not get the attention of your bar attendants or servers all of the time since they already know the things that they should be knowledgeable of before ordering. 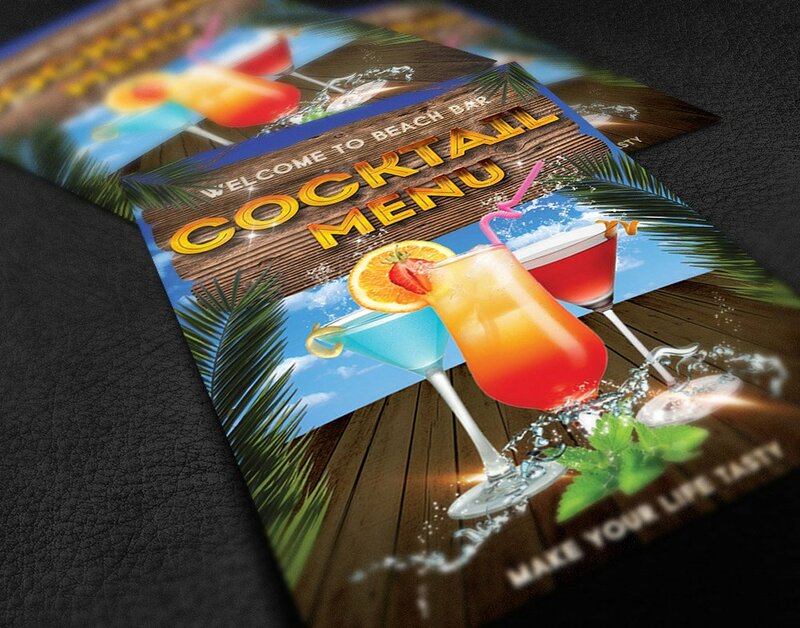 A cocktail menu can make your business stand out from your competitors. As one of your branding tools, the cocktail menu that you will use can be compared to those of your competitors. 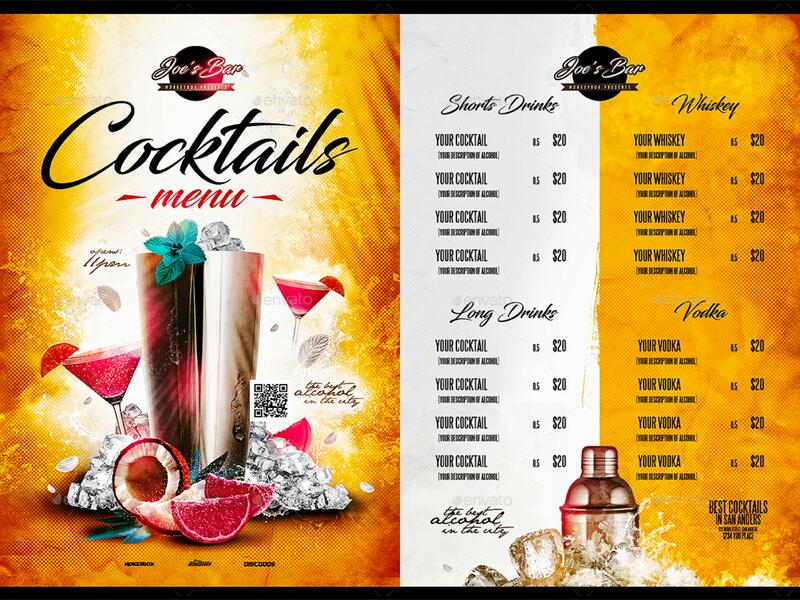 If you will create a strongly-branded cocktail menu, you can easily specify your stand in terms of originality may it be on your cocktail selection or the theme that you will incorporate in your cocktail menu design. 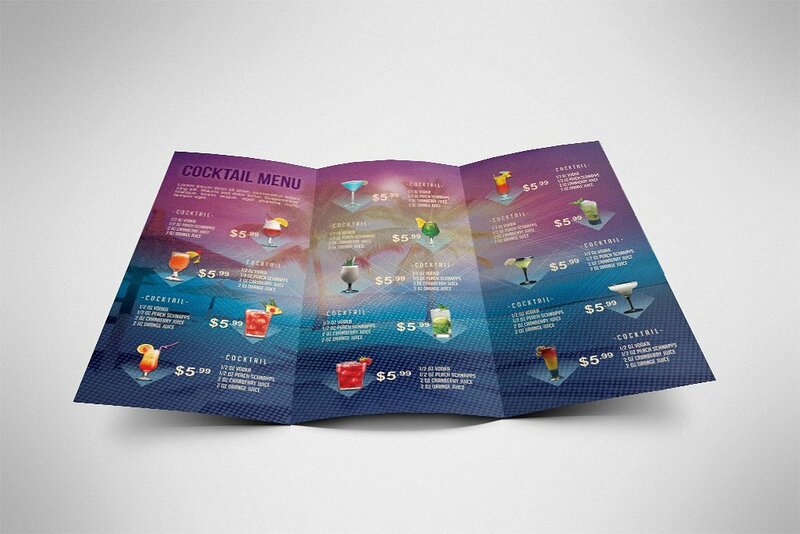 A comprehensive cocktail menu can help you maximize your business’ profitability. If you will place proper information that will appeal to your customers, you can easily sell the cocktails of the business. Presenting all your drinks and making them look put together and attractive will make your customers more interested to try your cocktail offers. A cocktail menu is an essential part of the bar operations as it is the first thing that customers will look for if they would like to order a drink. If you are already aware of the steps for restaurant menu creation, then it will already be easy for you to create a cocktail menu as the concept in making both of the menus are almost similar. Make sure that you are aware of your target. The content and design of your cocktail menu should be able to speak to your prospective and current customers. With this, you need to consider the age of the people who go to your bar as well as their purchasing power, social standing and their reason for drinking. Do not overwhelm your customers. Your cocktail menu should be direct to the point when it comes to pricing and drinks description. More so, your design should not be overpowering so that your customers can focus more on the list of options that you will give them. It is highly suggested for you to create a cocktail menu that is strictly for your cocktail listing. 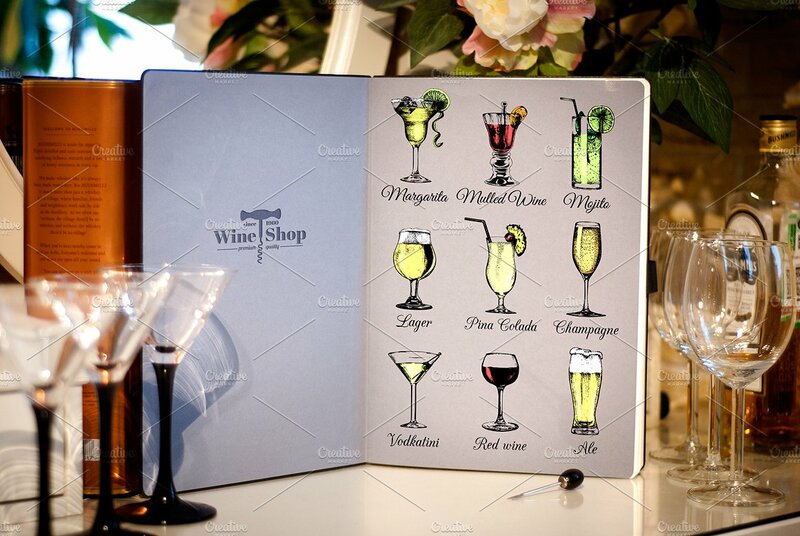 You can place your wine and beer selection on another document rather than putting them alongside the cocktail offers that your business has. This can make the process of ordering and menu browsing more organized. Always update your menu. There is nothing more irritating in a customer’s point of view than to look at a menu and be excited for the drink that you would like to have; only to find out that it is not offered anymore or it is sold at a higher price point. 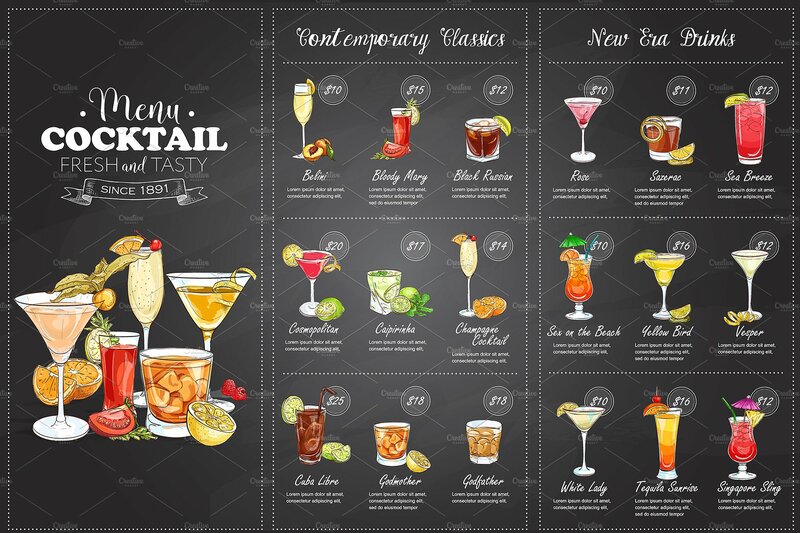 Since there are already a lot of modern menu design that you can use to create your final cocktail menu, there may be confusion on which of them is really appropriate for the specified activity. 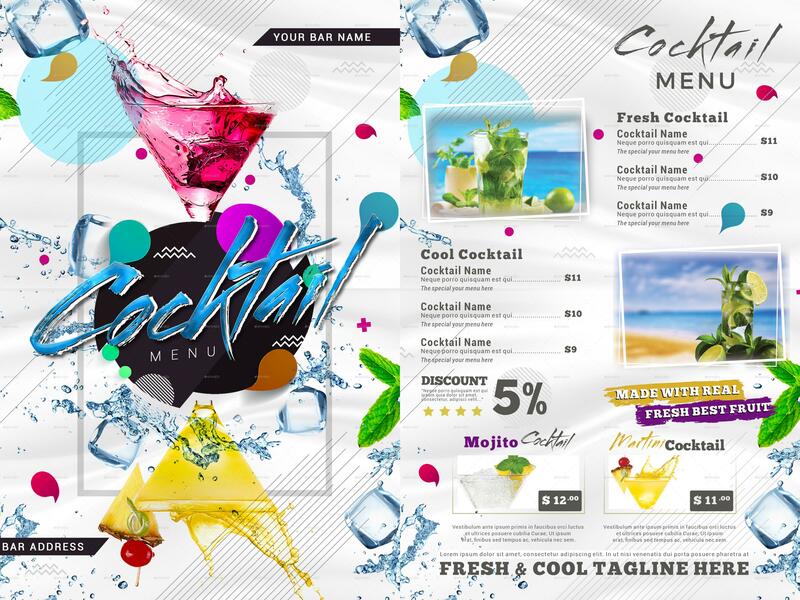 Listed below are some of the factors that you may consider so you can easily choose the cocktail menu design that you will incorporate in the creation of your business’ cocktail menu. The branding strategies of your business. As we have stated in the discussion above, a cocktail menu is more than a sheet of paper that your customers use to select a drink. You should incorporate your branding strategies when making your cocktail menu. It is important for customers to feel that your menu is original and is truly yours. With this, avoid using a generic cocktail menu as it can make customers feel that your offers are also generic or the same with what most businesses also offer. The kind of cocktails that you offer. It is essential for your cocktail menu to speak in behalf of your offers. 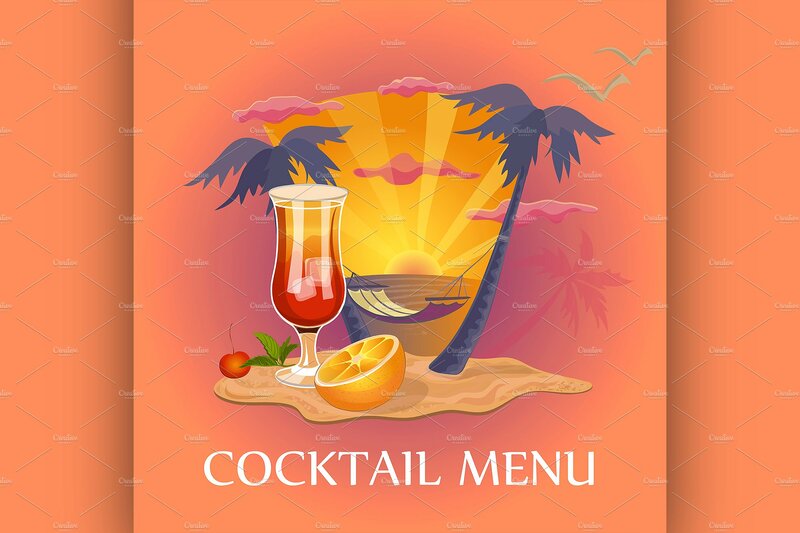 If your business is known for offering tropical cocktails, then use a tropical theme to serve as the layout of your cocktail menu. Make your menu a great part of the ordering process so that people can enjoy looking at it while selection the cocktails that they would like to get. The price points of your cocktails. If you are selling expensive cocktails, your cocktail menu should also have the feel of exquisiteness. You should ensure that the menu that you will use is at par with the quality of your cocktail offers. This can help justify even more on why you have placed cocktails at a particular price point or range. The ambiance of the business’ location. The theme of your business and the way that the place where people will drink is designed should be reflected on the cocktail menu. Again, having a relevant and coherent cocktail menu can add up to the overall experience of your customers. Be reminded of all the information that we have specified so you can be well-guided when creating your cocktail menu. It is very important to take this activity seriously as the design and overall appeal of your menu can affect your business’ profitability and branding. Make sure that your cocktail menu can leave a great impression to your customers so that they can be more than willing to repeat business with you.